1: Ensure baby has a clear source of air. 2: You must be able to place two finger between baby’s chin and chest. 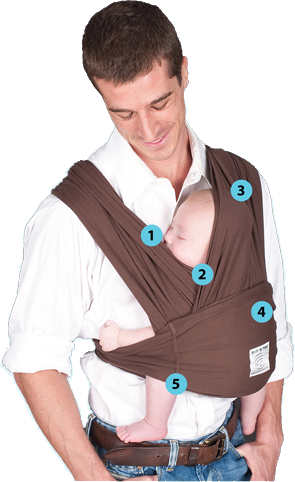 3: If baby does not yet have head control, use one of the loops to support his or her head. 4: For positions that require the sash: ensure sash is securely tied around baby. 5: For Hug, Two-Hip and Adventure Positions: ensure fabric is spread wide, reaching bend in baby’s knees, to create a comfortable and secure seat. 6: Check on baby often. Use extra care wearing a baby under four months of age.